Endothelial cells (ECs) form the inner lining of the vascular network. Although they can remain quiescent for years, ECs exhibit high plasticity in both physiological and pathological conditions, when they need to rapidly form new blood vessels in a process called angiogenesis. EC metabolism recently emerged as an important driver of this angiogenic switch. The use of radioactive tracer substrates to assess metabolic flux rates in ECs has been essential for the discovery that fatty acid, glucose, and glutamine metabolism critically contribute to vessel sprouting. 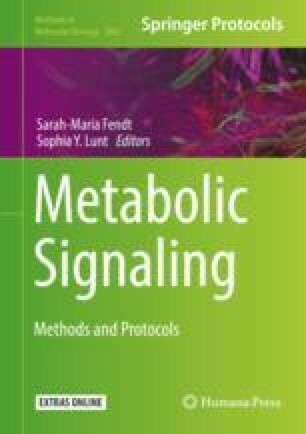 In the future, these assays will be useful as a tool for the characterization of pathological conditions in which deregulation of EC metabolism underlies and/or precedes the disease, but also for the identification of anti-angiogenic metabolic targets. This chapter describes in detail the radioactive tracer substrate assays that have been used for the determination of EC metabolic flux in vitro. Koen Veys and Abdiel Alvarado-Diaz contributed equally to this work.